Magnesium diboride (MgB2) becomes superconducting at 39 degrees Kelvin, one of the highest known transition temperatures (Tc) of any superconductor. What's more, its puzzling characteristics include more than one superconducting energy gap, a state of affairs anticipated in theory but never before seen experimentally. Now theorists at Lawrence Berkeley National Laboratory and the University of California at Berkeley, led by Marvin Cohen and Steven Louie of Berkeley Lab's Materials Sciences Division, both professors of physics at UC Berkeley, have calculated the properties of this unique superconductor from first principles, revealing the secrets of its anomalous behavior. Collaborators in the project included postdoctoral fellow Hyoungjoon Choi, graduate student David Roundy, and visitor Hong Sun. In the August 15 issue of Nature, the theorists report that MgB2's odd features arise from two separate populations of electrons -- nicknamed "red" and "blue" -- that form different kinds of bonds among the material's atoms. As well as explaining conflicting observations, their calculations led to predictions subsequently born out by experiment. Further, they suggest the possibility of creating radically new materials with analogous electronic structure. Bottles of powdered MgB2 have been sitting on the chemical laboratory shelf since the 1950s, but not until January of 2001 did Japanese researchers announce their discovery that it was a relatively high-temperature superconductor. Like high-Tc superconductors made of cuprate ceramics, MgB2 is a layered material; while undoped cuprates are insulators at ordinary temperatures, however, MgB2 is always a metal. "Structurally, magnesium diboride is almost as simple as pencil lead, graphite," says Louie. "It consists of hexagonal honey-combed planes of boron atoms separated by planes of magnesium atoms, with the magnesiums centered above and below the boron hexagons." This remarkably simple atomic structure would eventually prove the key to understanding MgB2. But in the hundreds of papers produced in the first rush to examine the new superconductor, experimenters using different techniques found many different, unusual, and sometimes conflicting properties. "It was like the blind men looking at the elephant," Cohen remarks. "Everybody who looked at MgB2 saw a different picture. Some said the superconducting energy gap was this, others said it was that; still others found anomalies in measurements of specific heat." It quickly became apparent that theories developed to explain superconductivity in the layered, high-Tc cuprates would not be helpful in understanding MgB2. Instead, Louie and Cohen and their colleagues used the well-established Bardeen-Cooper-Schrieffer (BCS) theory to examine the fundamental properties of MgB2, an effort made possible by a technique Choi developed to solve the BCS equations for materials with complex electronic structure. "When we looked at the elephant," says Cohen, "we saw that almost everybody had been right!" The many different pictures were in fact consistent. In BCS theory, electrons overcome their mutual repulsion to form pairs that can move through the material without resistance. 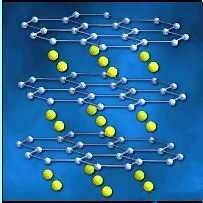 Vital to pair formation are the quantized vibrations of the crystal lattice, known as phonons. "Electrons pair by exchanging a phonon. If you think of a lattice of positive ions, you can picture them 'pulling' the electrons together into pairs, as vibration moves them toward passing electrons," says Cohen. What was puzzling was that, in BCS theory, the coupling to the lattice required to form an electron pair should be equivalent to the coupling of a single electron emitting and reabsorbing a phonon, giving rise to an enhanced electron mass. But in MgB2 these two values were apparently different -- a clue that more than one kind of electron might be involved in pairing. So the theorists began with basic considerations of MgB2's elemental constituents and layered structure. "To understand the importance of crystal structure to MgB2's electronic states, compare it to graphite," Louie suggests. In the hexagonal planes of graphite, each carbon atom, which has four valence electrons, is bonded to three others, occupying all available planar bonding states, the sigma bonds; its remaining electron moves in orbitals above and below the plane, forming pi bonds. MgB2, like graphite, has strong sigma bonds in the planes and weak pi bonds between them, but since boron atoms have fewer electrons than carbon atoms, not all the sigma bonds in the boron planes are occupied. And because not all the sigma bonds are filled, lattice vibration in the boron planes has a much stronger effect, resulting in the formation of strong electron pairs confined to the planes. "Partially occupied sigma bonds driving superconductivity in a layered structure is one of the new concepts that appeared from the theoretical studies; generally speaking, nature does not like unoccupied sigma bond states," says Louie. "Our other major finding is that not all the boron electrons are needed in strong pair formation to achieve high Tc. In addition to the strongly bonded sigma pairs, the boron electrons involved in pi bonds form much weaker pairs." Stated differently, electrons on different parts of the Fermi surface form pairs with different binding energies. The theorists' graph of MgB2's extraordinary Fermi surface -- a way of visualizing the highest-energy states its electrons can occupy -- clearly shows the two populations of electrons and the different energies needed to break their superconducting pairs -- a graph that incidentally gives rise to the nicknames "red" and "blue" electrons. Four distinctive kinds of sheets make up the Fermi surface. Two form nested cylinders: these map differently oriented sigma bonds and are colored orange and red to indicate the large amount of energy needed to break these superconducting pairs -- a large superconducting "gap," ranging from 6.4 to 7.2 thousandths of an electron volt (meV) at 4 degrees Kelvin. Two other sheets of the Fermi surface form "webbed tunnels" and represent the pi-bonded electrons; they are colored green and blue to indicate the low energy (1.2 to 3.7 meV) required to break superconducting pairs of these electrons at 4 degrees K, constituting a separate superconducting gap. The two kinds of electron pairs are coupled, and as temperature increases the superconducting gaps for "red" and "blue" pairs rapidly converge, until at about 39 degrees K both vanish. Above this temperature, all pairs are broken and the material does not superconduct. The detailed theoretical calculations of the superconducting gaps and their temperature dependence for the "red" and "blue" electrons made it possible to interpret the experimental measurements, including those from scanning tunneling microscopy, optical studies, electron photoemission, and neutron analyses, and from heat capacity and infrared studies -- each a different way of "seeing the elephant." Cohen and Louie and their colleagues performed their first-principles calculations on supercomputers at the Department of Energy's National Energy Research Scientific Computing Center (NERSC) based at Berkeley Lab and first shared them with the condensed-matter community last fall. Experimentalists have since confirmed many of the explicit predictions of their model. Among these was the existence of two superconducting gaps in MgB2, never before seen in any material. Yet BCS theory contemplated the possibility of materials with multiple superconducting energy gaps early on, and the discovery of MgB2 raises the possibility that others could be made. Louie and Cohen have long studied the electronic properties of unusual materials incorporating boron, carbon, and nitrogen. MgB2 offers a new model for layered materials capable of high-temperature superconductivity. NOTE 1: Recent high-pressure resistivity experiments performed on MgB2 show its Tc decreases quasi-linearly with applied pressure to 1.4 GPa at a rate of -2.0K/GPa. NOTE 2: Researchers Cristina Buzea and Tsutomu Yamashita of Tohoku University report critical current densities greater than 10 MA cm-2 and critical fields as high as 40 T have been achieved for thin films of MgB2.